To see volcano in a dream refers to a new job or relationship. To see that the volcano explodes in your dream may represent that you will be happy in your new job or relationship. To dream that the volcano is far away and it explodes means that you will start a new happy relationship or a new unproblematic job. To hear noise from volcano in your dream may represent that you will have a voice in your new job as soon as possible, you will see respect in an environment. If the noise is high, the impact in your jobs will be big. 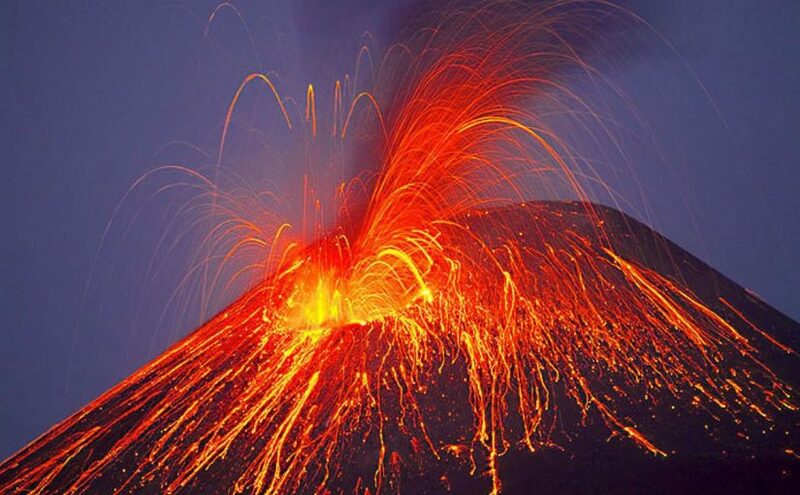 To dream that as the volcano explodes, you are close, the ground is shaking, lava comes to you, you are in danger means that intolerances concerning your relationship will begin, the behaviors of your spouse will disincline you from him/her. To see volcano which darkens the sky, smokes in your dream may denote that you will have a relationship which you hide from your close friends for a while. To see that the environment is full of volcano lava in your dream may represent that you will start journey with full of very big risks. You will return from this way as tired but happy and rich. To see that the lava seems coal and hot in your dream refers to good. If the lava takes cars, house and fields in your dream, you will have property and commodity. To escape from the volcano in your dream may denote that by noticing ill-intentioned people, you will be far away from these people and change your environments. To see people who escape from the volcano in your dream symbolizes that people who chose another people instead of you before will regret and they will come to you and apologies. If you see animals escaping from the volcano in your dream, it signifies that your relatives will reveal a problem about the heritage coming to you. Also, this dream tells that the creditor will remind you the debt you forgot or didn't pay attention.